Commenting on an alleged April 7 chemical weapons attack in Douma during an interview with Sputnik, local medic Mirwan Jaber specifically underscored that he and his colleagues had never treated patients exposed to chemical agents. Speaking to Sputnik, doctor Mirwan Jaber from a Douma hospital has described a video depicting victims of an alleged chemical attack in Eastern Ghouta as fabricated footage. "Many people burst into the hospital. Among them were those clad in medical outfit but they were not our employees, and I do not think that they were medics at all. They started shouting something about a chemical attack dousing people with water and all this was filmed. 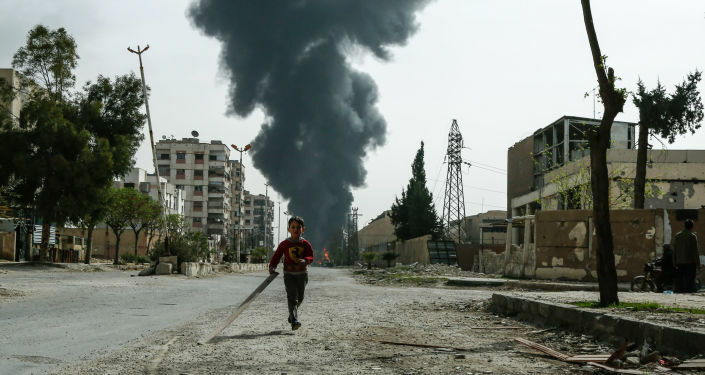 As a result, rumors were spread among Douma residents, something which in turn sparked panic," Jaber said. He added that the medics did not know the cause of all this chaos and that doctors approached people who were wet from water, but who had no signs that they were damaged by chemical weapons. According to Jaber, symptoms indicating that a person is affected by a chemical warfare agent include burns or sores on the skin and eyes, as well as coughing, chest pain, dizziness, nausea, drowsiness, involuntary urination and defecation, skin acne, rashes and severely narrowed pupils. "The participants of the staged video did not have these symptoms," the doctor underlined. He drew attention to the fact that using chemical weapons typically leads to the death of animals and insects in a kill zone where trees and grass wither, being covered by dust. "All those who were hit by chemical weapons can be hospitalized long after a chemical attack; a strong smell of fruit, flowers or garlic emerges in the air. As you can see, all this is not the case with Douma," Jaber stressed. Last week, Russian Foreign Ministry's spokeswoman Maria Zakharova said that Hasan Diab, the Syrian boy who told Russian Rossiya 24 TV channel about the details of the fake video of the alleged chemical weapons attack in Douma, should speak at the UN Security Council. Earlier this month, a number of media outlets and Western countries accused Damascus of using chemical weapons in the Damascus suburb of Douma on April 7. The Syrian government and the Russian Defense Ministry rejected the allegations as a false flag provocation, which they said was staged by the White Helmets group to influence public opinion and prod the US to launch a missile strike on Syria. The views and opinions expressed by Mirwan Jaber are those of the analyst and do not necessarily reflect those of Sputnik.